Xyntek-Antares Serializing For China! - Xyntek Inc.
Yardley, PA., December 5th, 2014 – A top 20 Multi-national pharmaceutical research and manufacturer utilizes the Xyntek-Antares solution and services to implement an expedited serialization packaging solution in order to meet product serialization requirements for the Chinese market. The requirements established for serialization by the Chinese government differ from the standards used in the USA. While each pharmaceutical packaging line generally possesses a unique serialization solution, this project and its serialization solution were specifically designed to meet requirements set for the Chinese Market. The Chinese pharmaceutical serialization market is a unique regulatory commission which utilizes the government controlled EDMC serialization codes. These codes must be requested by the manufacturer and reported back to the government regulatory body when the product is fully packed and serialized. •	Global Tracking System (GTS) software, for the management of production information, and management of data integration required for receiving and translating the serialization information obtained from the Chinese regulatory body. •	Master Tracking System (MTS) software for line control and manual case packing and serialization operations. •	Warehouse Tracking System (WTS) software to allow for rework and decommissioning processes after a work order has been closed and before the commissioning file is sent to the CFDA. 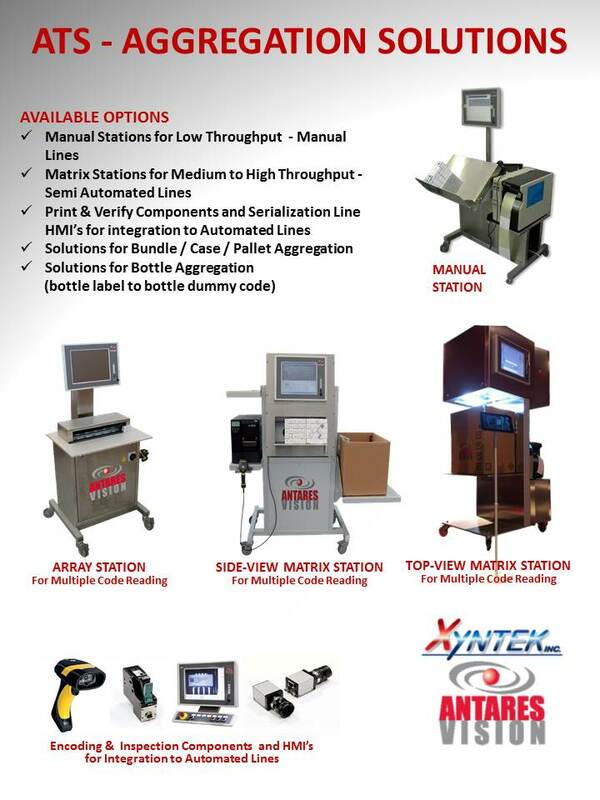 The Xyntek-Antares solution offer a suite of Serialization, Track & Trace, and e-Pedigree hardware and software modules, turnkey full systems integration, GMP Validation, and Project Management services to help the Life Sciences manufacturing corporations define and execute a comprehensive serialization strategy which covers the entire factory floor and packaging lines all the way through the entire enterprise and Supply Chain. With over 400 serialization implementations worldwide, and over 250 with full aggregation, from the unit, through case packing, through palletizing, the Xyntek-Antares solution is the most proven and mature solution in the world. Xyntek Antares Serializing For China!